Destination D, Here We Come! 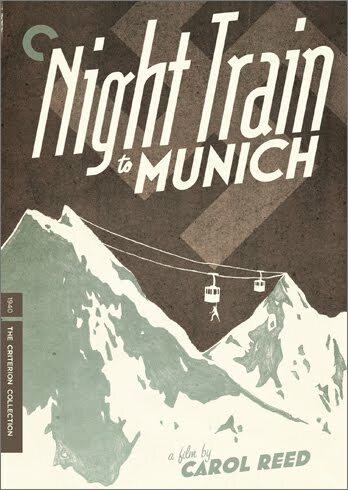 Thanks to the Criterion sale currently taking place at Barnes and Noble, tonight we watched the new DVD release of NIGHT TRAIN TO MUNICH (1940). The film proved worth the anticipation: NIGHT TRAIN TO MUNICH is a deliciously Hitchcockian, fast-paced suspense film with an ingenious, humorous screenplay by the great Sidney Gilliat and Frank Launder. NIGHT TRAIN TO MUNICH was directed by Carol Reed (THE THIRD MAN) and stars Rex Harrison and Margaret Lockwood. Lockwood was the star of another "train" movie with a Gilliat-Launder screenplay, Hitchcock's THE LADY VANISHES (1938). NIGHT TRAIN TO MUNICH makes very clever use of two supporting characters from THE LADY VANISHES, the cricket-mad twosome of Charters (Basil Radford) and Caldicott (Naunton Wayne). The film even starts out like THE LADY VANISHES, with a cute little model set which seems to place the film in a fantasy world...a fantasy world which abruptly vanishes with footage of Hitler's army invading country after country. In Czechoslavakia, Anna Bomasch (Margaret Lockwood) is arrested and thrown into a concentration camp after her scientist father (James Harcourt) flees the country. Karl Marsen (Paul Henreid), a fellow prisoner, helps Anna escape to England, where she is reunited with her father and aided by the mysterious Gus Bennett (Rex Harrison). Things are not quite as simple as they initially seem, and eventually everyone ends up back in Germany, where the story climaxes with a nail-biting journey on a NIGHT TRAIN TO MUNICH. I am not saying more about the plot so that those who are new to the movie can enjoy the surprises as they unfold. The movie speeds by like lightning; I was a bit startled to glance at a clock at the half hour mark and realize how much had happened on screen in such a short time. The film does a wonderful job alternating nerve-wracking suspense and marvelous bits of humor. Some of the lines are delightfully droll; I loved a scene where a bunch of worried British agents mix business with chatter of tea and recipes for the following weekend, and a scene with Charters and Caldicott musing on the fictional cricket player RAFFLES was very funny. I love Margaret Lockwood, on and off trains, and she has some wonderful lines as well as being a great beauty. The film chiefly belongs, however, to Rex Harrison, whose character turns up in the most interesting places. (The Criterion DVD booklet calls his character "shape-changing," while Glenn Erickson terms him a "proto James Bond.") It's a terrific role, and Harrison makes the most of it. Radford and Wayne also deserve a great deal of credit for making the movie such fun. This was one of Paul Henreid's earliest English-language films; he was billed as Paul von Hernreid. Soon after making this film in England he left for America, and by 1942 he had starred in the two films for which is is best known, NOW, VOYAGER and CASABLANCA. The Criterion DVD print is gorgeous. The sole extras are a "video conversation" about the film and an attractive booklet with background information and analysis, as well as a handful of beautifully reproduced photographs. A side note: although the DVD box says the film runs 90 minutes, which IMDb says is the U.S. running time, the film actually ran the U.K. length, 95 minutes. NIGHT TRAIN TO MUNICH can be seen occasionally on Fox Movie Channel. The film was produced by Fox's British division. NIGHT TRAIN TO MUNICH is grand entertainment which is highly recommended for purchase or the Netflix queue. A friend and I watched this movie two weekends ago (thanks to Netflix). We loved it but thought the plot was absurd in several places. We were laughing at the plot at times, because it just wasn't believable. But we loved the movie. Reality doesn't matter too much when you're having so much fun! LOL.